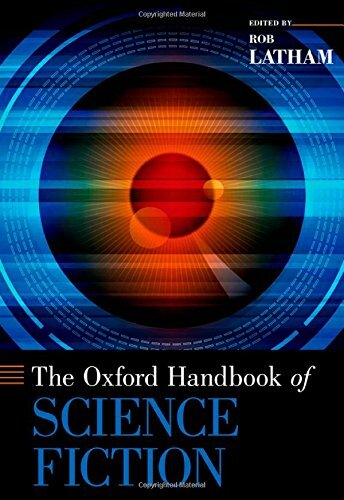 Rob Latham: The Oxford Handbook of Science Fiction. Oxford University Press, Oxford/New York 2014, 640 Seiten. The Oxford Handbook of Science Fiction attempts to descry the historical and cultural contours of SF in the wake of technoculture studies. Rather than treating the genre as an isolated aesthetic formation, it examines SF's many lines of cross-pollination with technocultural realities since its inception in the nineteenth century, showing how SF's unique history and subcultural identity has been constructed in ongoing dialogue with popular discourses of science and technology. The volume consists of four broadly themed sections, each divided into eleven chapters. Section I, "Science Fiction as Genre," considers the internal history of SF literature, examining its characteristic aesthetic and ideological modalities, its animating social and commercial institutions, and its relationship to other fantastic genres. Section II, "Science Fiction as Medium," presents a more diverse and ramified understanding of what constitutes the field as a mode of artistic and pop-cultural expression, canvassing extra-literary manifestations of SF ranging from film and television to videogames and hypertext to music and theme parks. Section III, "Science Fiction as Culture," examines the genre in relation to cultural issues and contexts that have influenced it and been influenced by it in turn, the goal being to see how SF has helped to constitute and define important (sub)cultural groupings, social movements, and historical developments during the nineteenth, twentieth, and twenty-first centuries. Finally, Section IV, "Science Fiction as Worldview," explores SF as a mode of thought and its intersection with other philosophies and large-scale perspectives on the world, from the Enlightenment to the present day. Da man bei Oxford University Press nicht sonderlich gut organisiert ist, habe ich zwei Rezensionsexemplare erhalten. Wer dieses nicht gerade billige Buch gratis haben will, soll sich bei mir per PM melden, es fallen nur die Portokosten an. Das zweite Exemplar ist weg. Meine Rezension ist schon vor längerer Zeit erschienen (im Science Fiction Jahr 2015, um genau zu sein), ich habe es aber verschlampt, sie online zu stellen. Dies ist hiermit nachgeholt.